Our trip to Enchanted Kingdom Theme Park in Sta. Rosa, Laguna Last October 16 was a blast! I think this is my best trip to the park eversince! I can really say that because I rally had fun and I have rode the most rides I've ever had incuding Rio Grande Rapids(White River Rapid Ride), Roller Skaters (Mini Roller Coaster), Flying Fiesta(Giant Swing Ride) and the Wheel of Fate(Ferris Wheel) which is probably the highest one in the country! Together with my Cousin Judy, Rjay and some of my College friends from De La Salle - Dasma, we had so much fun. Here are some of the pictures and photos that I had framed up using my camera's lenses. Hope you guys enjoy them! 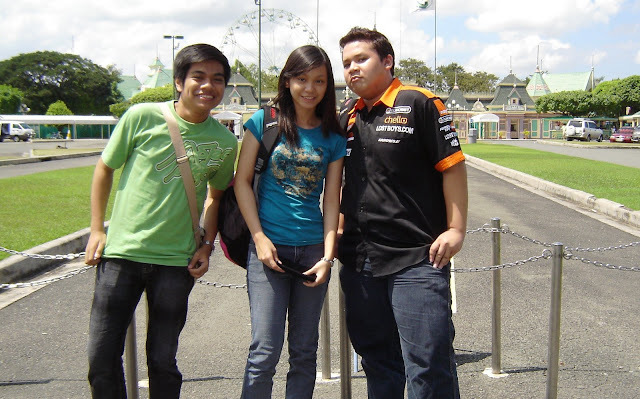 Me(Racer Shirt) with my friends before we went inside the theme park. Me with RJay and my cousin Judy. We were friends even from kindergarten till now. We all went to the same University but we have different courses. The three of us again on top of the Ferris Wheel! Look how anxious I look! Me posing oddly inside one of the fake tree roots. Notice that big bag of fat in my tummy! So embarrassing! Me while riding in the Wheel of Fate. This shot was quite appropriate because of what I wear and the karting track that can be seen below! Before we went home, Of coure I struck a pose in front of the Grand Carousel!